4000 psi pressure washer is the best unit for commercial purposes. Want to find out why? Read this article and know the best unit to buy! If the sole reason why you are eyeing to buy a new pressure washer is to make a living, then there is no doubt that you need a commercial pressure washer. But what is a good psi for a pressure washer for commercial use? According to many sources, including pressure washer experts, you should get a unit that has a minimum cleaning power of 16,000 CUs. Now, the best model for this is a 4000 psi pressure washer with 4.0 GPM flow rate. But there’s just one small snag. Hundreds of 4000 psi cleaners are sprouting everywhere, thus making it hard for you to choose the best pressure cleaner. If you want to know what to look for in a 4000 psi pressure washer, just continue reading! Finding the best 4000 psi pressure washer should be easy since there are a lot of options available in the market nowadays. To help you out more, I listed the things that you should consider when shopping for a professional power washer. You can choose between cold water pressure washer or hot water pressure washer to use as the main cleaner for your business. However, it is best if you have both units. Cold water power washers are great for removing dirt off any surfaces. On the other hand, hot water power washers are ideal for cleaning areas where grime, oil, and grease are constant. Hence, you have to consider the nature of your business to know which option best suited your cleaning needs. Click here to view the best hot water pressure washers! If there is one important part of the pressure washer that you should not compromise, then it would be the pump. Basically, there are two major pressure washer pumps to choose from, namely: the direct drive pump and the belt drive pump. Wondering which one is the best drive pump for commercial purposes? Most commercial grade pressure washers are used every day. In fact, the majority of your day would probably be spent using the power cleaner. If this is the case, then you should pick a 4000 psi pressure washer unit with a belt drive pump. Why choose the belt drive pump? Belt drive pumps are more durable and can last much longer. They are also very good at absorbing vibration during operation. Lastly, belt drive pumps don’t overheat easily. It would take major pump issues for the pump to overheat. The downsides of belt drive pumps are inevitable though (as there is no such thing as the perfect product). Belt drive pumps are quite expensive, not to mention that they need more maintenance as compared to the direct drive pump. To make your pressure washer last even longer, you need to choose a unit with thermal pump protection. This will serve as an added protection to your pump so that overheating will not be an issue. What thermal pump protection does is that it acts as a fan motor protection. It uses a thermal relay to break the power circuit if the temperature is at the level that would cause burning. There’s no better option when it comes to pressure washer tires for outdoor use than the pneumatic tires. A lot of pressure washer experts agree that the wheels play an important role in the maneuverability of the unit. And pneumatic tires have always been on top of the list when it comes to buyers’ choice. So, what makes pneumatic tires the best option for commercial cleaners like 4000 psi pressure washers? Pneumatic tires have excellent ability to absorb impact and shaking, as well as the ability to absorb uneven terrains. Hence, you can move the unit with ease for a smoother operation. Why should you consider the frame construction of the power washer? Well, the frame serves two functions— (1) for protection of the pump and engine and (2) for added durability. Cleaners for commercial uses should be highly durable as they are used on a daily basis. So, make sure you get a unit with sturdy frame construction. Make sure it is welded properly and is powder-coated to resist rust and corrosion. Now that you know the things to look for in a 4000 psi pressure cleaner, it’s time to get to know the 3 most popular options in the market! Briggs and Stratton Elite Series cleaners have been a popular choice for outdoor cleaning jobs. Thus, it is not at all surprising why their 4000 psi unit is included on the list. 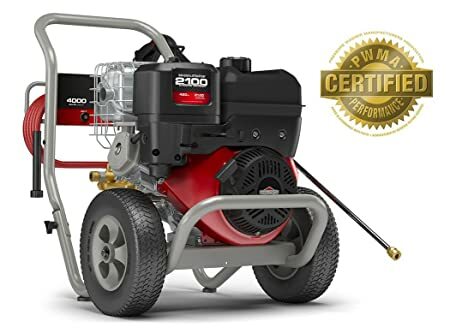 Briggs and Stratton Elite Series 4000 psi Gas Pressure Washer is a popular option because of its massive cleaning power and affordable price. With a maximum cleaning power of 16,000 CUs, you can do so much with this cleaner. It is equipped with impressive engine and pump that can withstand long hours of operation. This cleaner makes use of the Briggs and Stratton 2100 series OHV engine at 420cc. This high-power engine produces 21 feet pounds of torque power so that you can do more cleaning with less time and effort. With its Premium Annovi Reverberi triplex plunger pump type, you are confident that the unit can handle high-power operations for an extended period of time. You’ll also get 24-months of limited consumer warranty and another 3 months for a limited commercial warranty. Briggs and Stratton cleaners are also proven and tested by authorized labs, ensuring you of its quality and power. The unit also has an adjustable pressure regulator so that you can tune in the PSI level that best fit to the task at hand. It also has a high-temperature thermal relief protection valve to protect the pump. Also included in the package is the 50-ft high-pressure hose that is steel braided. It’s in recoil start, so it might take some time before you can use the unit. Oil can be easily spilled with this unit, so make sure you’re careful when refilling the fuel tank. Another well-loved commercial cleaner brand recently is Pressure Pro. This is why I can’t resist but to include this amazing unit on the list. Pressure Pro E4040HC 4000 psi Cleaner has a maximum 16,000 CUs cleaning power. It’s a powerful and reliable unit that is ideal to use for outdoor cleaning jobs. The unit takes pride in its Honda GX engine, CAT pump, and other amazing features. If you want a low-noise and reliable 4000 psi gas power washer that can last for a very long time, the Pressure Pro E4040HC 4000 psi Cleaner is the best pick. Honda GX is a commercial grade engine that is ideal for high-pressure cleaners. The CAT triplex plunger pump of the unit is very dependable that it can be used even in industrial operations. Also, the CAT brand triplex pump helps the unit to pull from a long hose better than AR pump. For added thermal protection, Pressure Pro E4040HC has a thermosensor that hampers overheating through the bypass mode. This unit is also CARB compliant, which means that the unit is environment-friendly. Also has 50-ft power washer hose for heavy-duty cleaning. Equipped with pneumatic tires, low oil shutdown, belt drive pump, and lifetime frame warranty. This is a recoil start unit, which makes it a bit difficult for novice users. The CAT pump is harder to rebuild and difficult to find replacements. Another Pressure Pro unit has made it to the list, but this time it uses an AR Brand pump. If you are wondering what difference does it make, then it’s actually very subtle. 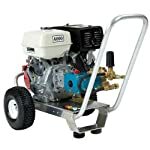 Pressure Pro E4040HA 4000 PSI AR Pump Gas Pressure Washer is actually the same unit with the other Pressure Pro cleaner on the list but only differs in pump brand. This unit makes use of AR pump which stands for Annovi Reverberi pump, also a well-known pump brand. AR pumps are known for their ability to run a lot cooler and their ability to produce the same pressure and GPM but with less HP. This means that less gas is used because the engine works less but can still produce efficient cleaning power. The Honda engine of the unit can withstand long hours of operations, perfect for commercial use. The AR triplex plunger pump runs cooler even on hot days. It is also easy to rebuild and find replacements. Pressure Pro E4040HC 4000 PSI AR Pump Gas Pressure Washer has a CARB certification, so it doesn’t emit harmful air and gas. Has pneumatic tires, low oil shutdown, and lifetime frame warranty. This one is a bit expensive; AR pumps are quite expensive actually. The AR pump is less durable as compared to the CAT pump brand. 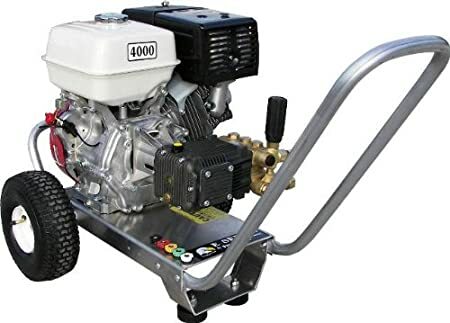 If I were to recommend the best 4000 psi pressure washer from the list, it would be the Pressure Pro E4040HC 4000 PSI CAT Pump Gas Pressure Washer. Pressure Pro E4040HC CAT pump cleaner has a highly durable pump which, for me, is the most important feature for commercial grade cleaner. Although AR pump is easier to rebuild and runs much cooler, the CAT pump is still highly efficient and can pull much pressure even with a long pressure washer hose. It is also an eco-friendly power washer cleaner with impressive belt drive pump and thermal sensor protection. With proper maintenance and a premium thermal pump protector, Pro E4040HC 4000 PSI CAT Pump Gas Pressure Washer will promote more uptime, thus you can do more tasks in less time. Want to view more heavy-duty pressure washer options? Click here! So, what about you? Which unit is the best 4000 psi pressure washer? Commend your choice below!